The meeting was called to order at 7:10PM. Minutes of the 6-23-16 board meeting were read and approved with a spelling correction – Pete Kresmery. Kristen will check if the CRAMBA website has changed the description of the trails at Stony Creek from beginner to intermediate. Jeremy Verbeke said the mechanized trail building at River Bends went well. The new trail could not have been duplicated by hand. It was 300.00 well spent. Jeremy Verbeke reported that we have 5 new bike patrollers. They have been trained but still need CPR training and certifications. Discussion took place about the future of the MMBA. Questions asked: Is the MMBA forum dead? Is the Website active? 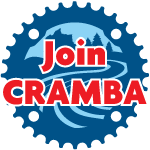 The Michigan Trails Advisory Council is meeting this Sunday in Bellaire Michigan and Nick is CRAMBA’ representative. Next board meeting will be on September 15 at the Firehouse at 7:00 PM (please note the new time). Meeting adjourned about 9:02 PM.